We present you the novelty of the year, the Indoor Flyboard. Now do Flyboard in Barcelona it’s easier and funnier than ever thanks to our new inflatable area. It was designed exclusively for a new revolutionary experience that only JetScoot can offer you. It’s an activity or an aquatic sport very popular now and very successful in the last years. The activity consists of a table with some specially boots with two powerful jets down that can make you fly above the water, dive and doing all the acrobatics that you know, according to the abilities of each one. "You’ll literally fly above the water "
Learning to do Flyboard isn’t complicated, but it depends so much of the maritime conditions that with a little wind and with waves it can make your experience difficult. Thanks to our “Indoor” area there will not be more complications. You’ll be able to learn and enjoy without worries about the waves, like it was a piscine, with the right conditions to fly. If you didn’t test it before, this is your moment. A simple Flyboard, easy to learn, without complications and with all the good conditions to fly! Jetscoot has created something new in our country. You can do the activity inside the harbor, in an inflatable area totally safe and with a design adapted to take the experience of the Flyboard to another dimension. Anyone can do this aquatic sport without complications. 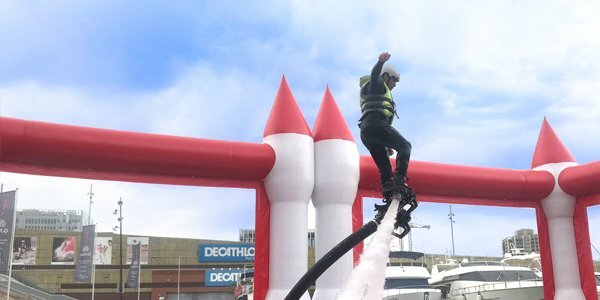 "We’ve turned the Flyboard into an activity that anyone can do." Until now, some people didn’t dare to do this activity because of its difficulty and also because its price. But now in JetScoot, we’ve changed it all! The Indoor Flyboard allows you to practice this sport at an affordable price. We don’t lose time transporting all the equipment to the open sea and we don’t have to worry about the waves. ¡Come and enjoy the experience to fly with the incredible Indoor Flyboard!